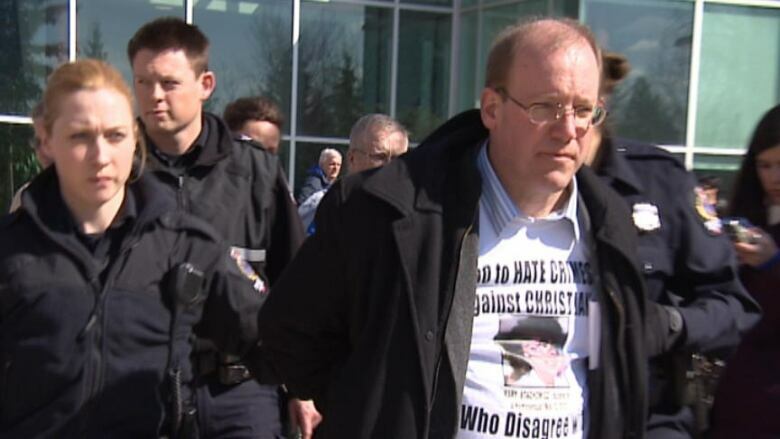 American anti-gay activist Peter LaBarbera and a Saskatchewan man were arrested on the University of Regina campus on Monday and will be charged with mischief, police said. U.S. anti-gay activist Peter LaBarbera and a Saskatchewan man were arrested on the University of Regina campus on Monday and will be charged with mischief, police said. LaBarbera, who is with a group called Americans for Truth about Homosexuality, and Bill Whatcott were distributing anti-gay literature on the campus. Before their arrival, the university issued a news release saying the pair would be monitored to ensure they did not engage in any activity that would promote hatred. At one point, with news cameras rolling, an unidentified university official approached Whatcott, 46, and LaBarbera, 51, and asked them to leave. During that encounter, Whatcott said he had attempted to get permission to set up an information table and, since he was denied, proceeded to set up a table anyway. "I'm not leaving," Whatcott told the official, "You guys are intolerant and should be ashamed of yourselves for shutting down our message without even considering it." University officials defended their decision to call police. "We are a diverse campus, we are a welcoming campus," Tom Chase, one of the vice presidents of the university said. "We celebrate that diversity and our staff felt that the material and some of the things they had with them simply contravened that policy and we asked them to leave." "The idea that you can't have an open debate on homosexuality on a college campus and some speech code is brought in, to kick people off ... seems to me to be pretty undemocratic," LaBarbera said. Late Monday, police issued a news release confirming they were called to the university around 1 p.m. CST and noted that two individuals were "engaged in a presentation of images and statements" and refused to leave the campus when requested by university security. "When both men refused security’s demand to leave, they were taken into custody, without incident," police said in their release. Last Friday, LaBarbera was briefly detained at the Regina airport, but was allowed into Saskatchewan to participate in an anti-abortion conference in Weyburn on the weekend. Police said the pair have a court date of May 16 for the mischief charges.